Closed-loop marketing is the process by which market intelligence learned during a marketing campaign is fed back into the strategy and plan. This can result in more focused targeting, more effective messaging and improved resonance of your marketing content. Until the past couple of years, closed-loop marketing could only be achieved through expensive, labor-intensive market research, which meant that it was only accessible to bigger brands. Now, it’s within the reach of even the smallest companies. 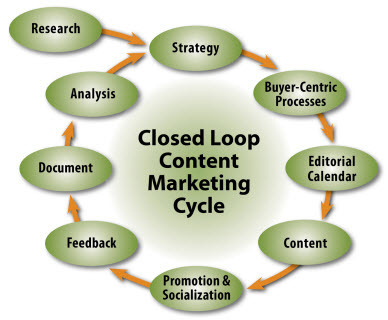 What follows is a brief overview of the closed-loop marketing process. Companies of any size can use this framework to help them feed insights back into the content marketing process and make better decisions. At the launch of any marketing campaign, it’s ALWAYS a good idea to make sure you have a realistic understanding of your product, the marketplace, your value proposition and competitive positioning. In this closed-loop process, I’m depicting a research step only at the inception. The process itself will automatically deliver new, deeper market intelligence as you roll it out. What are the objectives for the campaign? What roles and titles do they have? What business pains are your targets experiencing (related to your solution)? How will your product or service solve those problems? You can’t build relevant and useful content unless you know exactly who you’re talking to and what kinds of questions they have throughout the buying process. Start by refining your definitions of target prospects from Step 2 into actual personas (representative individuals). Next, construct a map of the steps that your prospects go through in making a buying decision. This is important to do because prospects have different informational needs depending on where they are in the buying cycle. Bring both of these steps together by creating message maps that identify the key messages that must be successfully communicated to prospects to move them to the next step in the buying cycle. Content marketers are publishers, and like publishers they must develop editorial calendars to give them a road map about which topics are going to be covered and when. Look at your message map and determine how best to deliver your content (via blogs, case studies, emails, magazine articles, podcasts, presentations, videos, web pages, webinars, white papers, etc.). Prioritize using all the information you’ve gathered in the preceding steps, and start building your content piece by piece. Odds are you don’t need to create everything from scratch but can use or repurpose existing content, in-house or third-party materials. Alternatively, you can curate content. That means you acknowledge the source and then put the content into context by explaining how it relates to your solution. Once the content is built, you need to let your target prospects know that it exists. If you have a permission-based email list or blog subscribers, you can deliver your content directly. Otherwise, you need to pull your targets to where your content is located online, or push it to where your targets are congregating in social networks. Also, optimize your content with SEO key phrases to help readers find it. Where do they immediately bounce off a page? Where do they linger and learn? Which pieces do they forward, post or tweet about? Where do they convert and take your desired action? What do they have to say in their blog comments? To leverage the valuable information you’ve collected in the previous step, you must gather the information, organize it and store it where you can search it and sort it. The more information there is (and tools like Google Analytics can generate tons of it), the more you’ll need automation in the form of an integrated Customer Relationship Management (CRM) system. Once you have the market intelligence you’ve gathered in a format that’s easily manageable, it’s time to measure how you did. This is an analysis process that translates the market intelligence into action items to course correct and tweak your campaign. What should you change regarding your target descriptions, personas, message map, vehicles and content? Today’s buyers are moving targets. Their needs and issues are constantly evolving. The economic environment is always changing. Technologies are continually being developed and upgraded. So it makes sense that our marketing campaigns should also morph in an attempt to keep up. Closed-loop marketing is ideal for B2B marketers who need to nurture prospects over extended periods of time. By continuously analyzing customer responses and refining your communications process and messages, you can adjust your campaigns to deliver highly targeted, relevant and effective marketing content. Do you use a closed-loop marketing process? If so, what are your favorite tactics and tools? Bob Leonard is the Managing Consultant at acSellerant. Over a 20 year period, prior to launching acSellerant, Bob held individual contributor and management positions in Corporate Marketing, Field Marketing, Sales and Sales Support at EMC, GTE, Interleaf (document management), and Digital Equipment Corp. acSellerant is a content and social media marketing agency focused on the B2B market place. Follow me on Twitter @acSellerant.